Should you use flashcards with Math Mammoth curriculum? Someone asked this one time, and it's a VERY good question! "Hi Maria! We will be using MM for the first time starting next month (light blue grade 1) and I was wondering if there is any recommendation of when to work on addition facts/flashcards throughout the worktexts, or if we just do that on our own with the appropriate lessons? We're switching from A Beka, which was flashcard heavy and had it all scripted, so I'm just trying to make sure I'm doing it correctly :) Thanks!" Math Mammoth is NOT scripted. It allows you to be creative in your teaching and adapt things to your child in various ways. For example, you're not limited to study only in one chapter at a time. If your child does better by studying 2-3 topics at a time, feel free to have them work in 2-3 chapters at a time (though, some chapters because of their topics are best studied in the order they appear in the book, but usually you have liberty to study clock, measuring, geometry, and money at most any time you wish). Also, I've always advocated the thought that the MOST CRUCIAL element in instruction is NOT the book, but the teacher, and that we shouldn't ever become "slaves" to the books, not even to Math Mammoth books. The best possible situation is when the instruction is tailored to the student's individual needs. Your Math Mammoth book is just a TOOL you can use to help teach your child. You as the teacher are still in total control, and you have the liberty to decide IF to use flash cards, and WHEN to use them. Children's needs are so variable that I really don't want to dictate when a child should review addition facts, or how. The curriculum does provide a list of online games and resources for that purpose (in the introduction of each chapter). You may use flashcards if you find them effective AND if they don't cause math anxiety. However, I don't want to put too much emphasis on flashcards, because too many adults have, because of their experiences in school, ended up viewing mathematics as "flashcards, speed tests, and memorization of rules" — which it is NOT! We should emphasize the notion that there are MANY ways to come up with the answer, and that the thinking processes, strategies, and patterns are more important than successfully and quickly producing the correct answer. 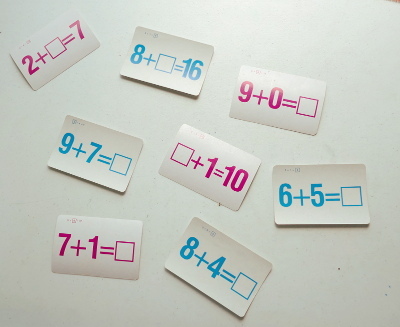 That said, it is definitely very helpful to know all your addition facts by memory — but it is even more important to learn a set of strategies for mental addition, because that "number sense" (being able to break apart and combine numbers in various ways in order to calculate something) is a crucial skill in order to succeed in mathematics.